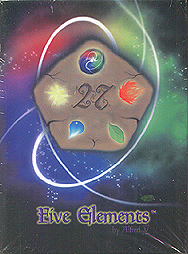 Five Elements is a quick and easy to learn card game with various difficulties suitable for little children up to card game fans and even for seasoned masters like poker players. The game is challenging and fun, full of action and strategy - every decision counts, any turn can be the last, anyone can win. Game Features: hidden information, bluffing and sniping opponents, changing rules, innovative scoring, beautiful design.